I was sucked into the desire for a heart rate monitor when a buddy of mine showed me his Polar FT80. The price and reviews on Amazon were a little disheartening and turned my attention to Timex’s line of heart rate monitors. 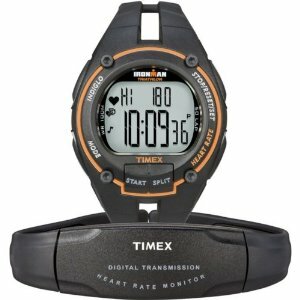 The price on the Timex Ironman Road Trainer was low enough for me to just grab one and deal with its shortcomings later. It turns out the shortcomings are few and far between. The Ironman Road Trainer seems accurate and durable. The heart rate readings are easy to confirm by checking my pulse, and the Timex heart rate monitor matches that pretty well. In use, the readings range from low 70s to the low 170s which seems about right for me. It tends to bounce around a little and sometimes gives an anomalous reading but I think it’s accurate enough for who and what it’s for. I wear the watch and chest strap while running, weight lifting, sparring, bag work, etc. They seem to be holding up well after about two months of daily use. The watch is easy to use once you get used to it and have been through the manual a couple of times. The curse of the watch form factor is that the button pushes required for stuff you don’t use often tend to require a return to the user manual. Fortunately, stuff like the initial configuration to set the watch up for the user and setting the time are things that don’t change very often. The manual itself is not great in any way. It works, but it’s sized to fit in the box more than it is for user convenience. Unfortunately, the Start/Split button is on the watch face and I bump it all the time. A button lock feature would be great and might even be buried somewhere in the manual. The only thing really remarkable about this device is it’s price point. On the other hand, it has just about everything I need. Heart rate, target zones, recovery time, max/min heart rate, calories burned, time in zone, user replaceable battery, etc. It’s all there. Depending how the Ironman Road Trainer story ends I can see getting a little more feature rich Timex or maybe a Polar in the future. I’d like to be able to upload stuff to a PC, for example. For now, my only complaint is the Start/Split button. Otherwise, the thing does everything I need for a reasonable price.